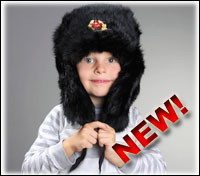 Colorful stylish Russian ushanka hats made of artificial fur. Come with removable metal badge (different insignias are available for each hat - your choice). These hats can be worn with earflaps tied on top or released down and tied under your chin for extra warmth.